WELCOME to the Pilgrim Morris Men of Guildford, the local men’s morris dancing side of Guildford, Surrey, England, since 1972. We dance a variety of traditions in the Cotswold style, generally dancing around Surrey and north-east Hampshire during the summer season. From time to time we will head off to other locations, mainly for tours or festivals, and we dance at corporate events. We always welcome new members so if you fancy giving it a go, come and see us during the Practice Season (October to April). We practice at Pewley Down School, Guildford, on Wednesday evenings between 8 and 10pm. 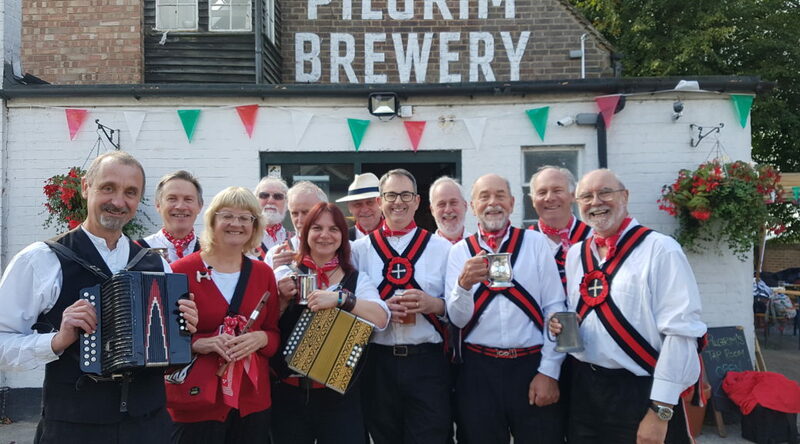 Being a Pilgrim is about more than dancing: we normally have a music session after our pub gigs and the team has a strong social side. We also present the traditional Guildford Mummers Play on Twelfth Night (6th Jan) in the oldest pubs in Guildford town centre every year as well as hosting the annual Summerpole festival each year on to welcome in the Summer. See our events calendar for details of where to see us dancing. Our current core dances are from the Adderbury, Ducklington, Field Town and Bampton traditions. For any amateur or professional photographers who would like to take photos of us for publications and web sites, if you let us know in advance, we can ensure we can line up the best photo opportunity for you. We are always very grateful for any photos or videos, we’re normally too busy to take them ourselves. If you’d like to see us in action, search for Pilgrim Morris Men on Youtube, there are lots of videos of us. You can also find us on Twitter and Facebook.